The great survivor of the sports car world – the Porsche 911 – has evolved again. Porsche today unveils the latest in a long line of 911s and the new one heralds the arrival of Porsche’s new twin-clutch transmission (dubbed PDK) and direct-injection. Amazingly, it makes the coupe nearly as fuel efficient as a family car, nudging 30mpg. There’s no new model designation this time: it remains a 997 at heart and Porsche calls the latest 911 a ‘second-generation 997’, despite a raft of technical changes under the same-again skin. It’s the same pattern as with the 996, which was revised after four years in production. The Carrera will cost £63,070 for the coupe (£70,360 for the cabriolet), while the Carrera S starts at £70,360 (£77,650 for sun worshippers). That's the condensed version of the new 911 story. Read on for the full, detailed breakdown of the most significant changes since the 911 ditched air-cooling. How green are the new Porsche 911s? It’ll save you pennies from the Exchequer, too. The manual Carrera emits an impressively low (for a sports car) 225g/km of CO2, making it a surprisingly tax-friendly device. 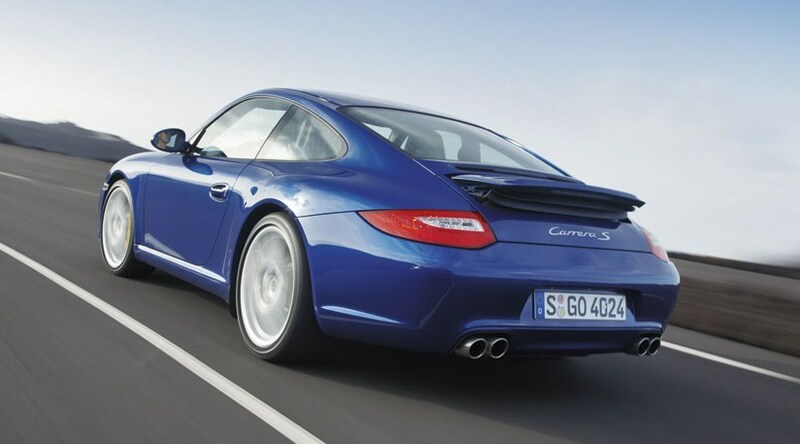 The Carrera S averages 242g/km of the evil stuff. No other near-supercar manages such emissions. An impressive seven percent less gas guzzling... How do they do it? Direct injection allows homogenous combustion, meaning more efficient burning with precise injection and combustion management. All new 911s now meet Euro 5 emissions regs not due in force until September 2009 and can run on a 10:90 ethanol/fuel mix. As part of the new set-up, there’s a new two-piece crankshaft on the flat six (replacing the previous four-piece item), new cylinder geometry, redesigned oil and water pumps – and it’s the world’s first boxer engine with direct petrol injection, crows Porsche. The whole shebang is 6kg lighter than before, contributing to the 911’s relatively slimline kerb weight. The base Carrera weighs in at 1490kg, ballooning to 1585kg for a Carrera S Cabriolet. So has Porsche gone all soft then? Hardly. The 3.6 has swollen in capacity a smidgeon, but 18cc is hardly going to startle anyone. The Carrera S’s 3.8 has shrunk by 24cc. But the proof is in the pudding and a wide range of mods has liberated more power and torque across the board. The new 911 is the first roadgoing Porsche to get the option of PDK transmission, which will cost £2338 in the UK. Porsche has form with double-clutch boxes, having pioneered the breed on the 1980s 962 Group C racer. Forty percent of Brits pick the current Tiptronic auto box, and Porsche predicts the twin-clutch system will be even more popular. If you don’t fancy the standard six-speed manual, PDK is available on both Carrera and S models. The old Tiptronic S auto ’box dies. The new gearbox offers seven forward ratios, and drivers can slot D or operate manual mode via the gearstick or paddles. PDK shaves two tenths off each car’s 0-62mph sprint and makes them more economical, as seventh is an overdrive. Spec anoraks take note: if you pick the Sports Chrono pack with its launch control wizardry, you can shave a further two tenths off the benchmark sprint. Abrupt, ballsy gearchanges cut the 0-62mph times to 4.5sec (Carrera with PDK) and 4.3sec (Carrera S with PDK). What about the chassis mods on the new 911? All Carrera S models get a revised PASM electronically controlled damper set-up, which remains an option on the Carrera. If you want to ruin the ride, then pick the sports suspension option, which drops the 911's ride height by 20mm; to be honest, we’ve found little wrong with the standard set-up, which now benefits from revised spring and damper rates all round. The brakes are bigger, too, measuring 330mm front and rear, and PCCB ceramic discs are an – undoubtedly expensive – option. Both models can be ordered with a limited-slip diff. How do I spot the new Porsche 911? They’ve moved the front radiators around and removed the third central rad from the snout – freeing up more space and allowing the front end to be gently reprofiled. It’s easier to spot the new 911 from the back end, thanks to those distinctive, chamfered rear light packs. And what about inside the new model? Porsche has tried to cut down the number of buttons and clutter in the 911's cabin, thank goodness.The interior has never been the 911's strong point – even the last version felt uninspiring, if well built. A new touchscreen system called Porsche Communication Management (or PCM – how they love their acronyms!) controls most media functions and is compatible with iPods and onboard television options. You can pick between snazzy Bose sound systems and there’s a 40GB hard disc sat-nav system available, too. We've sat in the new 911, and you naturally enjoy the usual compact size and easy-to-place view out. So the new 911 is even easier to drive? It should be, yes. Maybe it says something about where the 911 stands in 2008, but you’ll enjoy a raft of new creature comforts on the latest 997: a hill-start function holds the car on inclines without rolling back; individual tyre pressure monitors warn of any tyre problems; bendy headlamps peer around corners; and ventilated seats now grill or chill your posterior as required.